Good Ole Alaska, And I Thought Palin Was Bad For Wildlife! ALERT!! I’m asking you all to help contact Alaska Governor Sean Parnell and express your outrage about this. Feel free to e-mail or call his office. As emotional as this is, please don’t threaten anyone. But Alaskan resident or not, we need to continue to make our voices heard on this! Wolf pups have a high enough mortality rate without trigger happy hunters involved. In addition, contact your local state representatives, newspaper, and even set up a booth in a library to inform the public so they too can educate others about these horrific acts. Even if these atrocities can’t be stopped in the short term, WE can educate our youth and work on stopping this in the long run! “Shame on Alaska governor Sean Parnell for allowing the “kill-on-site” policy for wolf pups and bear cubs orphaned by state predator control to continue. Friends of Animals has learned from Rick Steiner, professor and conservation biologist, that despite the wildly popular rescue of wolf pups abandoned in the Kenai fire last week, which was covered on national television news, the State of Alaska announced June 2 that it would not alter its “kill-on-site” policy for newborn wildlife orphaned by the state’s predator control programs across western and northern Alaska. These pups escaped death because they were rescued by firefighters before the Alaska Department of Fish & Game could get their hands on them, and have been adopted by the Minnesota Zoo instead of being killed. But the future is bleak for future pups orphaned after the State of Alaska kills their parents. After killing all of the adult wolves from two wolf packs on the South Alaska Peninsula in their spring 2008 predator control effort, ADFG biologists pulled 14 newborn wolf pups from the two dens, and shot each in the head. Subsequent public outrage led to the adoption of the state’s wolf pup protocol in Nov. 2008, which called for the live collection and placement of orphaned wolf pups in zoos and other facilities. Then in May 2009, with no public notice, prior to the continuation of the Alaska Peninsula wolf control program, the state adopted a new wolf pup protocol that called for the lethal gassing of wolf pups orphaned by predator control efforts in western and northern Alaska. Although there has never been a reported case of rabies in wolf pups, the rationale the state gave for adopting its new lethal protocol in western and northern Alaska was a purported risk of rabies in wolf pups. But given the lack of rabies risk, many wildlife advocates feel the new “kill-on-site” protocol was actually adopted for other reasons, including: the current state administration, and its political supporters, harbor an irrational disdain, even hatred, for wolves; in remote areas, without the watchful eye of the news media, the state feels it is more expedient to just kill orphaned pups than to arrange their collection and placement; the state doesn’t want to attract attention to the inhumane consequences of its scientifically unjustified predator control programs by providing an opportunity for news media to cover the live collection and placement of orphaned young; and the state doesn’t want the public to understand that the “hidden” effects of its predator control programs are far greater than just the number of adults killed. Wolf pups and bear cubs remain dependent on their parents for more than a year, thus parents killed by state predator control or liberalized hunting and trapping regulations also results in the death of dependent cubs and pups, which are not added to the kill count. A month after the new kill-on-site protocol was adopted, on June 7, 2009, two newborn wolf pups that had been orphaned by the state wolf control effort in the area, were lethally gassed in their dens with carbon monoxide by ADFG biologists. Their carcasses were not collected and tested for rabies, and left to decompose in the den. This was the first, and so far only, time in state history that newborn wildlife has been lethally gassed. This remains state policy today. In Feb 2014, ADFG was asked to rescind its 2009 (lethal) wolf pup protocol, and revert to its 2008 (non-lethal) protocol, but the agency declined, again citing its concern for rabies in wolf pups. Then, after the rescue of the five Kenai wolf pups last week the state was asked again to apply this non-lethal collect-and-place protocol to the entire state, arguing not only that there has never been a report of rabies in wolf pups, but also that the half dozen reports of rabies in adult wolves in the historical record (the past 70 years) were all from the Arctic. Thus the risk of rabies from wolf pups, or even adult wolves in the rest of Alaska, is exceedingly low. The agency did not provide an explanation for why its veterinarians feel rabies in wolf pups presents a risk when there has never been a reported case. 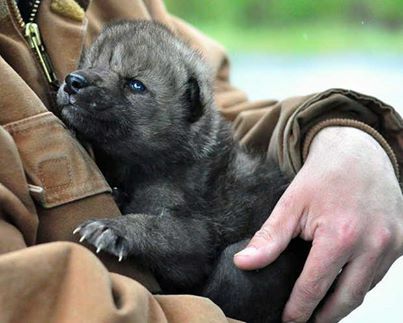 Thus, any wolf pups found orphaned by the state’s predator control programs in western and northern Alaska will continue to be lethally gassed. Additionally, in a May 29, 2014 press release, ADFG admitted that its biologists had recently (this spring) killed newborn black bear cubs in its Kuskokwim (GMU 19A) predator control effort. Apparently there was no effort made to collect-and-place the newborn bear cubs. Unsubscribe to no longer receive posts from The Wolf Preservation Blog. Another case of police abusing their authority occurred this month, ending with the death of a beloved family dog in Michigan.Presesrve Freedom reported the story. Now the family wants answers as to why their dog was shot. Bianca Alakson of Redford, Michigan and boyfriend Ryan Showalker thought they were doing everything right in protecting their dog Rocky a 10-month old lab/pit mix. As with many dog owner who have had their furbabies murdered by police, they were wrong. Police were chasing a suspect through the neighborhood, and claim they saw that person inside the home. This, they say, gave officers the right to ignore a “beware of dog” sign on the fence in the back yard. Officer’s entered their property through an unlocked back gate. After Ryan heard gunfire, he ran outside to see what happened. When he was told Rocky had been shot, Ryan broke down in front of the officers. At this time Ryan was placed under arrest for interferring with the investigation and resisting arrest. So far, no charges have been filed. We all know what happened to Rocky. Come on everyone, say it together now “The dog was aggressive. The dog was attacking and we feared for our lives.” Rocky was shot once and injured. The officer who murdered Rocky said the pup continued to charge, so he fired his weapon again. The second round proved fatal. Bianca and Ryan, along with neighbors who knew the dog, claim Rocky wasn’t aggressive. Neighbors who heard the commotion said police screaming at the family and using profanity was all they heard. No barking, no growling. Ryan is still waiting to hear what charges he’ll face from that tragic night. The Facebook community is demanding an outside investigation into Rocky’s death. Most likely, the officer will be cleared by the department, if an investigation even takes place. Dog shootings by police continue to rise, with a dog being injured or killed every 98 minutes. What do the police want dog owners to do? We put our dogs in a fence-you shoot them. We put “beware of dog” signs outside the fence to warn anyone that a dog lives on the property. You shoot those dogs also. To hold a position that claims “to protect and serve,” police are making a joke out of that motto. Hopefully, Bianca and Ryan will file charges against the officer responsible, the Redford Township Police Department, and any town municipalities involved. Police don’t shoot dogs because they have to-they shoot them because they can. The majority of dogs shot by police never see justice, and even when they do, the family is left to grieve for the death of a beloved family pet. A list of Redford Township officials can be found under the department heading on their website. Feel free to contact them, and to also leave a few words on the Redford Township Police Facebook page.